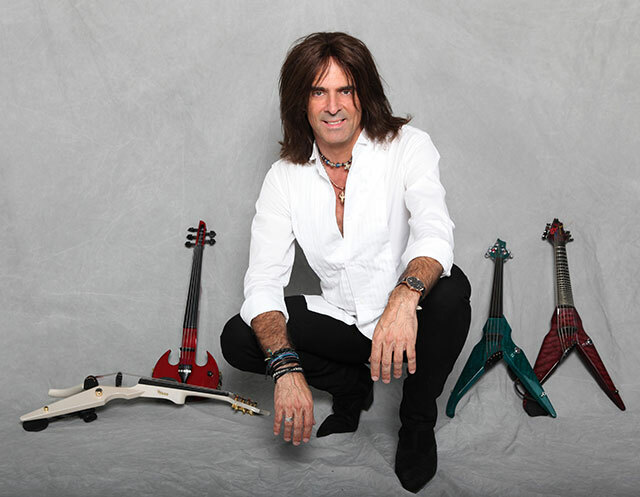 Recording artist, performer, producer, inventor, Emmy-winning composer and music education advocate Mark Wood has spent the past four decades electrifying the orchestra industry – literally. Wood is a world-renowned performer who rose to fame as string master and original member of the internationally acclaimed Trans Siberian Orchestra. A successful solo artist in his own right, Wood writes and records original music for film and television, has released six solo albums, and tours with his band The Mark Wood Experience (MWE). His commission credits include The Juilliard School and extensive TV broadcast music including The Winter Olympics and The Tour de France (for which he won an Emmy). Mark’s highly-anticipated Turbow album is his latest release on Viper Nation Records, and is being heralded as “the most dangerous rock violin album ever.” The Fire ‘n Ice video (the first single from the album) underscores that point in a dramatic way. Wood has collaborated with and appeared alongside some of the biggest names in music such as Lenny Kravitz, Celine Dion, and Kanye West. As a member of his touring band, Wood had the honor of performing with the legendary Billy Joel for both historic final concerts at Shea stadium, sharing the stage with Paul McCartney, Steven Tyler, and Roger Daltry. He also starred in a Kanye West produced national Pepsi TV commercial and has appeared on the world’s most venerable stages including Carnegie Hall, Lincoln Center, and Madison Square Garden. But his true passion is music education. His program Electrify Your Strings (EYS) – now in its 18th year – is an intensive rock and roll workshop for school music education departments that boosts student self-esteem and motivation and helps raise money for music education. EYS and its team of Artist Mentors visits upwards of 75 schools per year and has been featured on The Today Show, CBS Evening News, and in countless local media outlets.